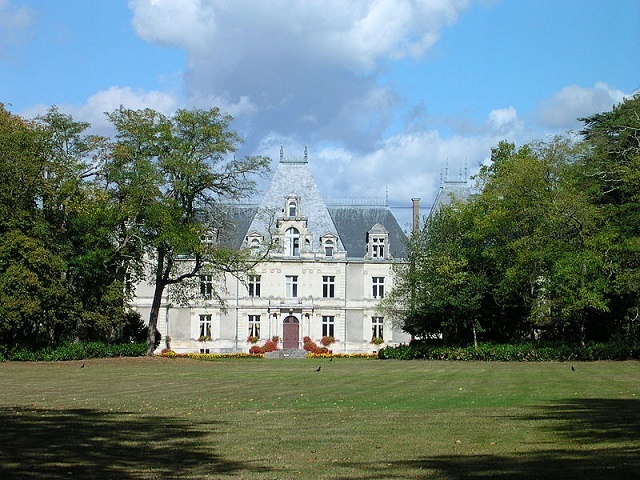 Location: Carquefou, in the Loire-Atlantique departement of France (Pays de la Loire Region). Notes: The castle of Maubreuil is located in France, in the commune of Carquefou, department of Loire-Atlantique, region of Pays-de-la-Loire.A chapellenie was founded on this estate, on 25 December 1671 under the patronage of Saint Anne. Before the French Revolution Maubreuil wrote Maubreil. The current castle was built in 1815 by the merchant and shipowner of Felix Cossin's privateers at the site of an old castle set on fire during the Revolution, of which only a pigeon house, a private chapel and a hunting lodge remain. Of the seventeenth century. In 1934, the Marquis of Dion ceded the estate to the department which had a sanatorium built in the park. The buildings were inaugurated in 1938. In 1972, these buildings housed a functional rehabilitation center. In 2013, a steering committee composed of the hospital center, the general council of Loire-Atlantique, Nantes Métropole and the commune of Carquefou validated the sale of the hospital center and the land adjacent to Crédit mutuel for the construction of a Training center. He also opted for the transfer of the castle, the outbuildings, the house of the pond and the old farm to the company Astrolade. The rest of the estate was purchased by the municipality.